For those bead loving birds in your house ... here's a new one made out of sturdy beads! Longfellow has a faceted, bead in bead "head, that rests on a flower wheel, followed by a large plastic spool, which is sandwiched between flower wheels. There's a chunky barrel bead hiding the first knot of many. 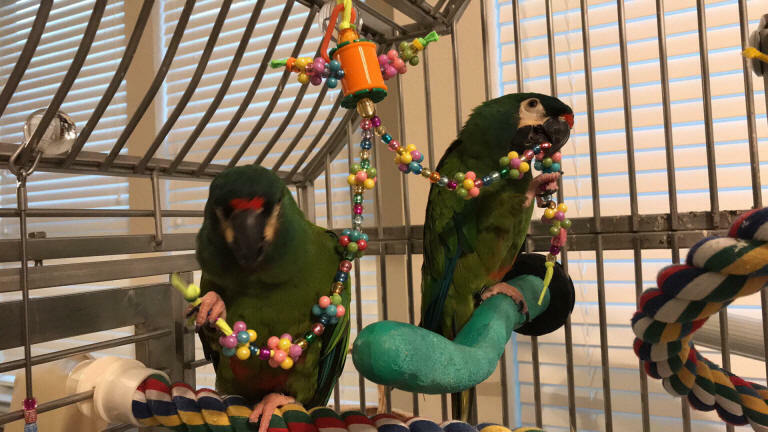 The "arms" and "legs" are filled with fancy round beads and multiple atom beads (which also hide knots so your birds can't just snip and drop). Finished off by the Busy Beaks signature "B"s on the bottom, Longfellow is strung on a bright, colorful, fun neon shoelace. There's a simple parrolink on top that is covered ... which you can use for easy hanging. Or remove it and place it on your own quick link or play stand via the loop on top. Almost all of the knots are hidden to make it a bit more challenging for your bead loving feathered family! These are a sturdier bead so it should prove to be a bit more challenging for your FID! 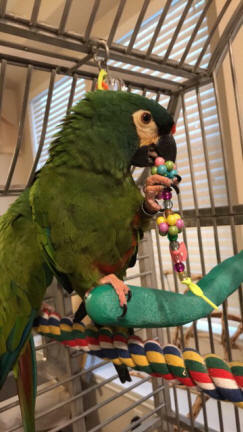 Longfellow quickly became a favorite for bead loving Illiger Macaws, Mac & Larry ... thanks for the photos Amy & Josh!! 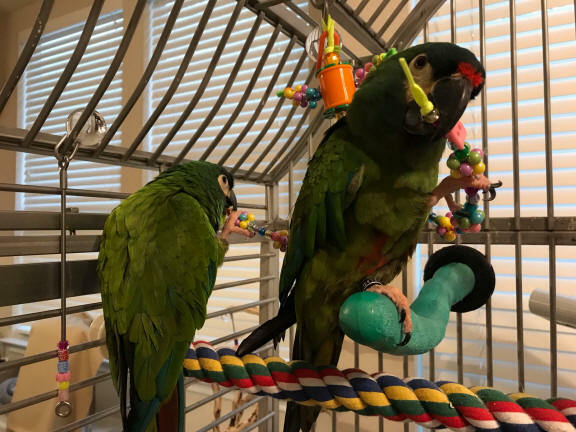 If your parrot is into foot toys, be sure to check out Busy Beaks Busy Body! Great fun for the bigger beaks in your house! Please monitor your pets and make sure they don't actually consume non-edibles!